We all love to post photos on Facebook, right? 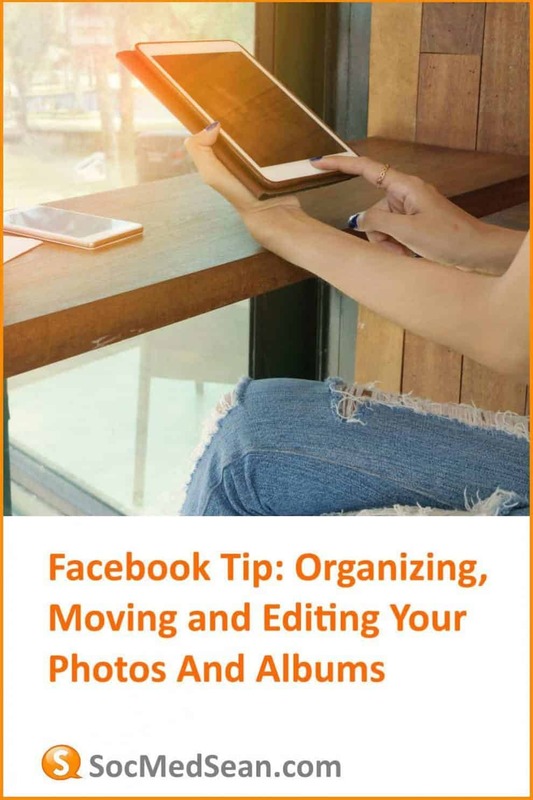 The challenge is that while positing photos is easy to do from your phone or tablet, organizing them into albums within Facebook can be a real pain-in-the-you-know-what. It seems that the Facebook User Experience Engineers have designed an organization system that seems logical to them, but in real life isn’t really intuitive to most of us. 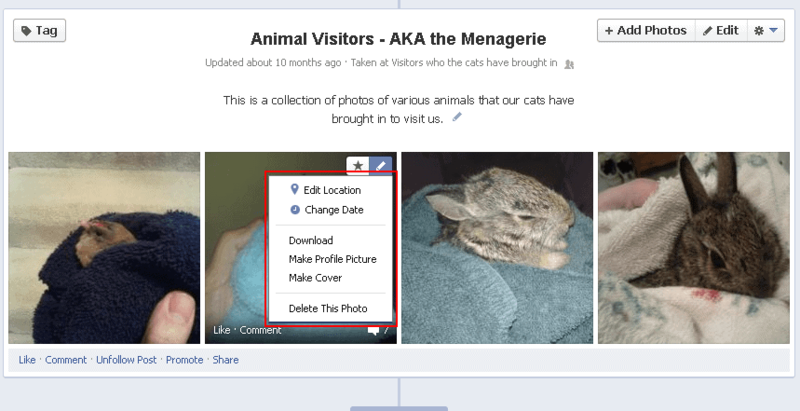 A while back, I wrote a post about uploading and organizing your photos on Facebook. As Facebook made changes, I tried to keep it updated with the slight UI changes to the albums and photo organizers. As I went to update for the umpteenth time…I realized that it would probably be better to just start a new post and give the most recent instructions without all the history. Likely, I’ll have to update this one 15 times, too…but that’s the world of Facebook, right? So if you’re just looking for tips on how to organize your photos, here are the most recent instructions. Quick Note Before We Start: If you are trying to figure out how to move and organize photos in a Facebook GROUP, read this post instead. The first step in getting organized is making sure you have the right albums. Facebook doesn’t let you create albums on-the-fly while you’re organizing them, so the best thing to do is go through all your current folders and see if there are some logical groups. Make a list. Yes…with a pencil and paper. 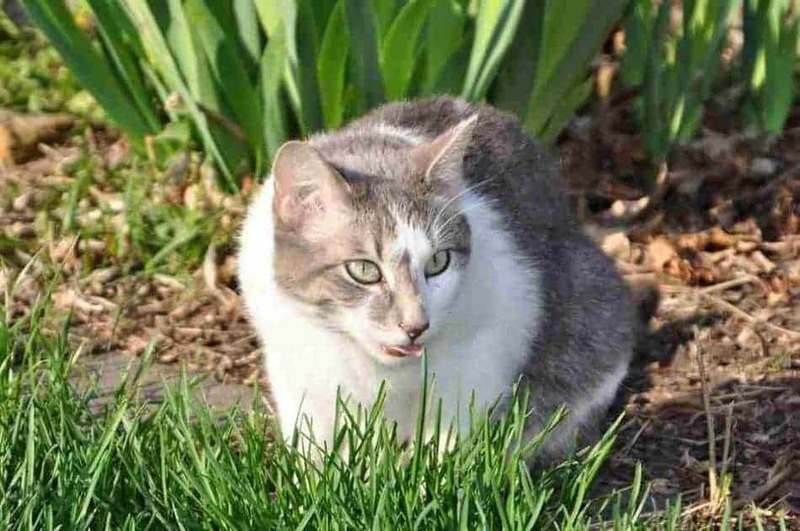 For me, the groups are basically family photos, pictures of good things to eat, critters who have visited my house, cute pet photos and cupcakes. Yes…I’m a bit of a cupcake fanatic so they get their own albums. To create a new album just go into the Albums section of your photo gallery and then click “Create New Album”. Facebook doesn’t provide an intuitive way to create an empty album (there is a way, but it ‘s strange), so it’s best to upload a photo into the new album. Don’t worry…you can delete it later if you don’t want to keep the photo in the album. Once the photo is selected, give your album a new name and describe the types of photos that people can expect to see in the album when they browse it. If the album contains photos that were all taken in the same location (e.g. Hawaii or New York City) you can also add a location. Just before you click the “Post Photos” button in the lower-right corner, be sure to set your privacy settings by clicking the gear icon and choose who can see the photos in the album. 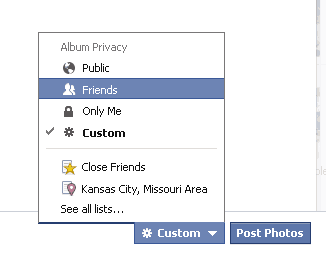 Remember, this privacy setting will be set for all the photos you are uploading. Once you click the “Post Photos” button, the new folder will be created and you’ll be able to move other photos into this album. As I mentioned, moving photos between albums isn’t very intuitive. For me, I would just go to the individual photo, choose to edit it and expect that I can move the photo to another album from there. But this isn’t how it works. In the image below, you’ll see that the drop-down menu for editing a photo doesn’t include a link to “Move To Another Album”. Soooo…we’ll have to determine a different way to accomplish this. To move a photo from one album to another, you don’t edit the photo….you edit the album where the photo currently exists. I know, not very logical but hey…Facebook never asked me. 1) First, decide on which album you want to move the existing photo from. You can see the full listing of your current albums by choosing the “Albums” section at the top of your photo gallery. 2) Next, click the album where the image currently resides. In my case, I am moving an image out of the “Mobile Uploads” album and into a new one I have created. 3) Click the “Edit Album” link which will give you a tiled view of the photos in the selected album, giving you more control over the album and the ability to move photos. 5) Select the new album and then click “Move Photo” and you should be all set! But what if a photo is just too embarrassing or isn’t something you want posted on Facebook anymore? You can delete a photo by locating the photo, clicking the dropdown menu on the upper-right corner and selecting “Delete This Photo”. Facebook will ask you to confirm, and then once you delete it…it’s gone from your albums. Keep in mind, however, that it may not be gone from Facebook forever, though. Buckle up…here comes some legal-speak. But it’s important that you understand whether your Facebook photos are REALLY deleted from Facebook. Registration information: When you sign up for Facebook, you are required to provide information such as your name, email address, birthday, and gender. In some cases, you may be able to register using other information, like your telephone number. Information you choose to share: Your information also includes the information you choose to share on Facebook, such as when you post a status update, upload a photo, or comment on a friend’s story. So, while this sounds all well and good, what Facebook is saying is that once you upload a photo to Facebook, it is theirs to use as they please. My point in telling you this is to remind you that just because you delete something from Facebook, doesn’t mean it’s gone forever. Who knows, that embarrassing photo of you at the office party might actually show up in Facebook’s marketing materials because you uploaded the photo and Facebook chose to include it under their “innovative features and services we develop in the future…” clause. Just to set the expectation, understand that something uploaded to and then deleted from Facebook isn’t necessarily deleted forever. Hopefully, that helps clear up the process of adding/editing/moving/deleting photos within your Facebook albums. If you see something that isn’t clear or have an additional tip to help others out, be sure to leave a comment! I just downloaded about 20 photos into an album and did “hide from timeline” because i wanted to organize them first and put descriptions. Now i’m trying to create a post with all of them but when i try to create a post it wants me to download new pics. How can i use the ones in my album?? It’s so frustrating!!! At some point in 2018, I was able to move or “associate” a post (check-in, a set of pictures etc) to an existing album, you would just click edit post on timeline and there was a add to album option. I no longer see it arghh! Any idea how to perform this? February 2019 “Move to Another Album” option is gone… Now what? is it possible to lock photos in a specific order within a fb photo album? How to upload 1000 photos at a time in the uploaded order without changing sequence ? Thank you for your post. I couldn’t figure out how to move a photo from my Timeline to an Album! Putting it under “Edit Album” is just crazy. Will the link from my post to the photo be updated when I move a timeline photo to an album or will this mess up the original post? Amusing post to get more organized on facebook. Thanks for the nice post. I am sharing!! This doesn’t work. My uploads from iphone are in a place formerly known as “mobile uploads”. Buts this is not available as an album. If I go under “My photos” and select one of these photos I’ve uploaded to my timeline, the “Move to another album” option is missing. However, if I do go to another photo that is in a bonafide other album, the “move to another album” option is there. Facebook is just completely out of control with its user-unfriendliness. Is think they are trying to get Google to take over the world. Is there any value left in Facebook? It is so NOT what we all want it to be, from only showing us CERTAIN friends’ posts but NEVER showing other friends’ posts, to not being able to move already uploaded pictures to albums. It’s just stupidly inane. Let me clarify by saying that neither a Timeline album nor a Mobile Uploads album are any longer available under my photo albums. Both. Gone. Pfffft. Same position – no longer able to access this way – no mobile uploads album. I used this facility in July for 26 posts over an earlier holiday to go to one album, but now, nothing! I’ve spent 3 hours googling around. I’ve deleted all the photos of my phone in anticipation of being able to consolidate. Arggh!!! Have you gotten an update on this issue yet? This is so frustrating. well explained, thank you for taking time to record and share! No more Move to another album option. No more drop down v either. Grrr. Thanks so much for this timely advice! I was ripping out my hair trying to figure out why I could move some photos from my timeline, but not others. By selecting the Timeline ALBUM edit option, I was able to move whatever photos I wanted, quickly and easily! I moved a entire post from one album to another and now it won’t let me edit that post in the new album….Help anyone? So I just moved months worth of photos of my NEW BABY from ‘Mobile Uploads’ into a ‘Baby’ album and they are ALL out of order and have TODAY’s time stamp!!! WHY would they not keep their original date!?? HOW can I know which pictures were taken first now!??? PLEEEEASSSEEE HELPPP!! I need to know how to move pictures from one Facebook to a new Facebook. How do we organize the photo albums themselves? I used to have a link I could use for one of my facebook pages, but now instead of sending me to my page albums, it takes me to the albums on my personal page. Sigh. I have the same question for my group page. Why is Facebook pulling an image from my albums and posting it separately on Timeline? I don’t want this. I want to control my own Timeline. If I put an image in an album, that’s where I want it to be. The only options given for the extra individual image posted on Facebook (by Facebook) are to “hide from timeline” or “delete”. Both of these options also take the image out of the album. Facebook STOP doing this. Stop posting images on my timeline I don’t put there individually. And/or give me an option for removing the image you posted without also removing it from the album I so already carefully arranged. This has also happened to me. I hope someone will answer. I’m not seeing Facebook albums any more. Do you know if this is a planned change or a glitch? When I move a photo that was posted to a timeline status update to a new album, it disappears from the timeline (leaving just the text and comments etc). So I have to make sure I select the appropriate album at the moment I post, which is an annoyance on a mobile phone. I wish FB could fix this, and please let me know if you know another way to do this. I agree. I’ve just noticed this deletion of photo or video from the original timeline post. This wasn’t the case previously, when the pictures or videos would be retained in the post, but the content moves to the “Album” of choice. Was this a new change? Or a recent bug? Hi thanks for helpful info. I want to order my folders of photographs. How can I do this? How can I move a folder so it is first in my list of folders of photographs, etc? Select the Albums page so you’re looking at all your albums. Hold your mouse on the album you want to move & drag it to the position you want it to be in & release your mouse. How can you organize the order of your albums within a group page? The albums are on multiple pages and I have not found a way to move them from one page another. I was able to move photos within an album (clumsy, but they still moved) through April 26 but not since then; why would FB delete that option? Any tips on moving old photos into a new album? I’m a page admin and want to “clean up” a bunch of old photos and put them into albums. It doesn’t look like I can do this but I’m thinking someone’s got to have come up with a work-around! I have the same issue – as a group admin, want to move photos between albums (photos that were uploaded by other group members, not me). Any solution to that???? On my iPad 3 how can I transfer Facebook Timeline “Photos of You” to an existing album? line: I should not have to upload a photo to create an album. Thank you. Perhaps creating an album with a title text picture would be a good solution? Or upload one picture, but set the privacy to you only so it’s not visible to everyone else. I do not really want to create an album, I just wonder why when I put a photo from my timeline into “my photos” then delete it on timeline it removes it from my photos too. I see some people with multiple photos but no album. How is this done? I have a photo album on my desk top that I want to move to a new face book album. Do I have to move each photo, one at a time or is there a way to move the whole desk top album to FB ?? I have a new problem. My mobile uploads no longer go to Mobile Uploads album. They go straight to Timeline Photos where I cannot move photos! This doesn’t seem to work for Cover Photos or “Photos of Me”. Is there a way to move these photos into albums, too? Sean, can you please tell me if there’s a way to organize the photos within a single album? I have one album with photos of my experiences during the few years I lived in Europe. I would like for them to be organized by date (in chronological order). I cannot for the life of me see how to affect the order of the photos in this album. It’s total chaos. Help! You can’t reorder the photos in an album any more – ridiculous! This page was SUPER helpful in helping me organize my photos! Thanks!…. One question tho, when i go to my album “Cover Photos” (album containing banner photos on timeline) the option to “edit the album” does not exist. How do i move “Cover Photos” to another album? Is it possible? But m trying to move a photo from one album to another in Facebook app on my mobile..
There’s no ,option such as edit.album on facebook app. Plz do reply about this what to do??? This is a great post! Any tips on rearranging the order of photos within an album? I’ve found that the previous “click and drag” method doesn’t work anymore and in fact, FB has been randomizing the order of pics as I upload them (even if I upload in my desired order). Advice? Yes, this worked for me, too. I always post a few from mobile at an event but want to make an album later with more fixed-up ones. You can use this same method after fb messes up your photo order. Make a new album (viewable to only you at first, if you like! ), Move the photos into there in the order you WANT, then get rid of their original location. The tags and comments come with them. You and drag them around in that album before you save it. I have spent hours and hours on our vacation pics trying to get the sort order right and I click save and and every time I move them the way they go and/or add more they move them around. I want to scream. Yes there are more then 200. Is that the problem? Please tell me so, I have serious health problems and need to know so I can get on with my life, this is insane! People talk about a done button but I have no done button. thank you for the instructions on how to move photos from album to album, i’d have never figured that out on my own! Still can’t seem to re-arrange the order of photos within an album. Used to be able to do it, but can’t figure out how to do it now. Is this possible? I can’t do it either and want to scream. The option to move isn’t there – just to make cover, or delete. Same issue here – did you find a solution? Did anyone find a solution to this problem? Moving photos already present in the timeline album? FYI – as far as moving photos goes, you cannot move photos that were added in a multiple photo upload, nor can you move the cover album. Why can you not do this anymore? This was so helpful! Thank you so much! Do you know how to change the order of the photos in an album? I used to be able to do it with the old settings, but I can’t figure out how to do it now. I looked through your site, but I couldn’t find it. Thanks! Thanks! Zuck sure makes it tough to keep up. When I get frustrated with FB, I remind myself that it is free and also pretty cool.